"A quick temper will make a fool of you soon enough." 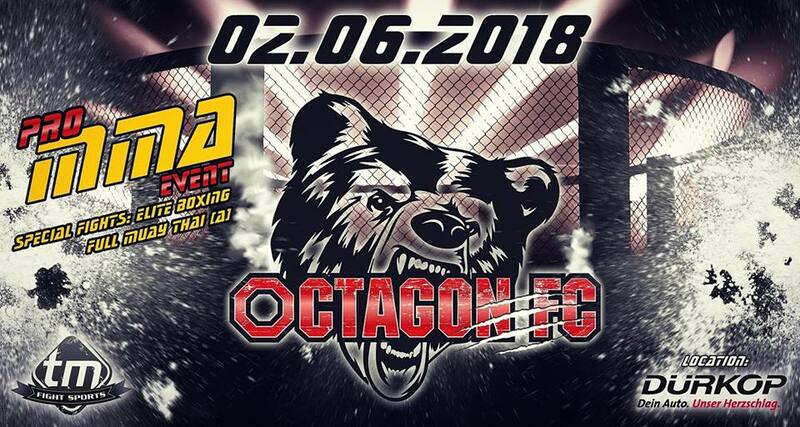 In the second edition of Octagon FC in Göttingen, the heavy guys are leashed in the Main Fight. Local hero Szymon Kosman seems to have been able to stop nothing and nobody since his move from the light heavyweight division to the heavyweight division. He has five consecutive wins, knocking three out of his opponents by knockout and two by submission from the cage. He celebrates two of these wins at We Love MMA. Visit this great event! Dear MMA Land Community, we are proud to announce that Aleksandar “Joker” Ilic won the battle by unanimous decision of the judges. However, something that we did not know is that Ilic came in into the fight with a broken rib! We will have the opportunity to watch him in the ring at FFC since he signed a contract with them for several fights. The “Joker” also revealed that his next fight will take place at the very first event "FIGHT Fight's", which will be held in April 22 in Novi Sad. Aleksandar is just only waiting for the conformation by the opponent. Ones more MMA Land Team congratulates Aleksandar! We wish you all the best on the way to UFC!!! Aleksandar revealed that he has signed for FFC to three fights! Congratulations!Yours MMA Land Team!!! For all people who doesn’t know what FFC stands for, here a brief reminder. Following the example TV industry institutions such as HBO and It’s Showtime, in 2012 Fight Channel launched its own fighting sports production named FFC® – Final Fight Championship®. So far FFC® held 26 events with a unique concept – combination of MMA and kickboxing matches in one evening. Unmatched when it comes to production, FFC® ring hosted some big stars such as Mirko Cro Cop, Ray Sefo, Ricco Rodriguez, Paul Daley, Alessio Sakara, Robin van Roosmalen, Pavel Zhuravlev and many more. In a very short period of time, FFC® became one of the best European fighting sports promotions. FFC® is broadcasted LIVE in more than 50 countries around the world, on four continents, as well as on numerous national TV stations such as CBS Sports Network in the USA and well-known Canal+ in France. Today we would like to present you a one of the famous MMA- facilities in Asia, the Phuket Top Team MMA Training Camp. Great trainers, great country and great location! A high class location for MMA-fighters. Phuket Top Team MMA Training Camp is a world class MMA facility based in Thailand. With a focus on personalised training and a team atmosphere at Phuket Top Team we have paved the way for many MMA fighters, potential fighters and those serious about their MMA training. Thailand is the home of Muay Thai and Asia is the booming home of Mixed martial Arts, Phuket Top Team are taking full advantage of the Muay Thai skills and teachings available to complement a well rounded training program including, Submission Wrestling Gi Brazilian Jiu Jitsu Freestyle Wrestling Western Boxing Muay Thai K-1 striking and of course the MMA class. To supplement these classes Phuket Top Team will have Strength and Conditioning. Aleksandar "Joker" Ilic - The show must go on !!! Today: Eduardo Ramon steps-in to fight Alexey Kunchenko on September 10th !!! Official RIZIN GP 2016 Opening round viewing tour – from Hong Kong and America! !